Sunday was warm and breezy, a perfect summer day to walk around the city. My friend Leslie and I started at SOWA, perusing through the vendor stalls and food truck offerings. 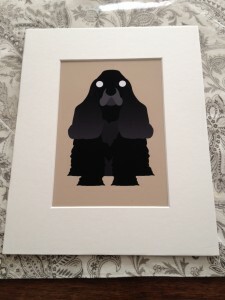 I bought an art print that I still haven't decided if I like or not, but it is hard to find anything cocker spaniel in black (it is almost always in buff). We strolled through the food trucks, but I suggested a walk up to Chinatown to try a banh mi at 163 Vietnamese Sandwiches. The shop is small, but service is fast. I got the cold cut sandwich ($3.5), the classic mélange of assorted pork products, cilantro, picked carrots, daikon and cucumber. Leslie got the BBQ beef sandwich ($3.75). We took our sandwiches to a shaded picnic table, just outside the Chinatown gate. 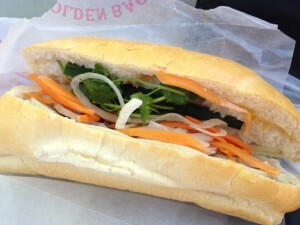 I enjoyed my sandwich, although it does not come close to my favorite Banh Mi in Lowell. I think the filling was stingy, so the ratio of meat to bread was off. Leslie took a bite and I asked her how it was and she said, "I don't know, it was all bread, but the bread was good." The bread was light and crispy. Her BBQ beef was sweet and tasty. 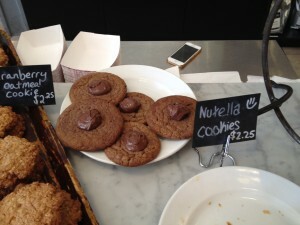 We walked on to Bread + Butter in the North End and shared a Nutella cookie. It was delicious; chocolaty with a perfect chewy texture with a dollop of Nutella on top. We continued walking by Quincy Market, and through the Boston Public Gardens. It was a perfect Boston summer day.